View our current inventory of used generators and contact us for more information or to get a quote. Nobody has to tell you that disruptions to your company’s power lines can cause major problems for business — but the good news is, you can keep them from happening. Thanks to industrial grade used and surplus generators from CellSite, your business doesn’t have to be at the mercy of thunderstorms or unexplained power outages. With one of our used commercial generators, you have a way to keep operations running smoothly; no matter what kind of power problems occur. At CellSite, we have a wide selection of used industrial generators for sale, so you can have backup power when you need it. The benefit of a commercial generator — whether it’s propane, natural gas, or diesel — is that your company’s processes keep moving forward, even if a disruption in the power line occurs. Business generators are made to be able to handle large-scale power needs, providing power indefinitely until the main power line is working again. This means they offer your business the stability of uninterrupted processes, even when you’re using heavy machinery, a large network of computers, elevators, high-level medical equipment, and more. Any time the power is disrupted, your generator kicks into place, seamlessly supporting your daily tasks. Commercial generators are specially designed to support commercial power needs, so everything from your office lighting to your employee computer network continues working while you wait for the regular power to return. If the power goes out in the middle of the night, your building’s alarm system doesn’t falter. If a storm shuts off the power in the beginning of a business day, your staff can continue business as usual and your clients can continue receiving support. Your generator prevents power disruptions so your business can continue running smoothly and serving customers. Diesel generators are just one of the types of used industrial generators we provide. The goal of a diesel generator is to provide backup power, even when all other forms of electricity are not functioning. Many people may find it surprising, but diesel generators are very efficient and cost effective, especially when used only as a backup to electrical power. Since diesel generators run on fuel oil, they can operate even after a major storm or another emergency in the event natural gas may not be accessible. When you are concerned about power disruption, a new or used diesel generator is an excellent option so you can keep offering service to your customers. Another backup generator type is a propane generator. Propane is nearly impossible to spill and is clean burning, making it safe and sanitary for storage. When it comes to emergency preparedness, propane is a great choice. That’s because there is no electricity required to fill propane tanks and propane will safely store indefinitely. Finally, propane generators are usually quiet — so you won’t worry about noise while your backup generator is operating. Ideally, you will not need to turn to backup power very often, but when you do, you can feel confident that your generator will get the job done right every time. When you’re looking to purchase a used industrial generator, CellSite is your best resource. Backed by over 20 years of experience in the telecommunications industry, we are well versed in the needs of businesses. What’s more, we spend time getting to know each client’s situation and needs so that we can provide just the right product(s) to meet your goals. 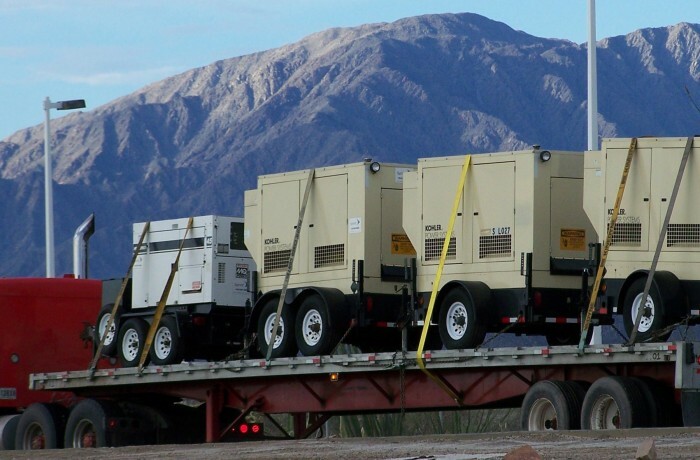 CellSite offers a variety of used generators, from a single-phase generator to a 3-phase generator, in order to suit different industries and needs. CellSite knows generators so well, we not only sell them, but we service them, too. If you’re interested in getting your generator serviced or repaired, come to us. We can help you with various generator types, including Cummins, Kohler, Katolight and Caterpillar/Olympian. We’ll help you stay up and running so your generator is ready when you need it. Looking for a commercial generator for your company? Need servicing on an existing generator? Contact us today to learn more about the used and surplus generators we carry and/or to set up an appointment for service.